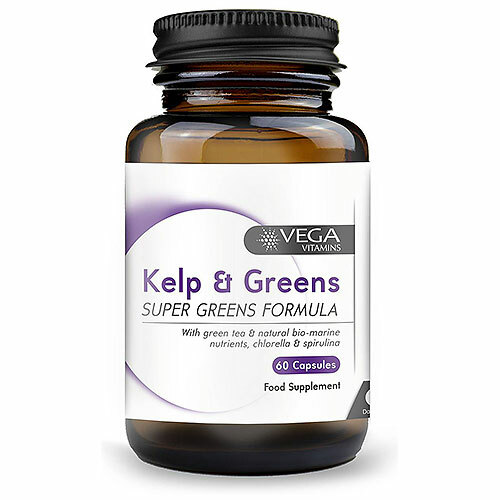 This formulation provides an effective combination of kelp, sea algae and green tea, and may help to support the immune system. Kelp is a type of brown seaweed and provides a rich natural source of Iodine. Kelp (Ascophyllum nodosum) Seaweed, Vegetarian Capsule Shell (Hydroxypropyl Methylcellulose, Colours [Titanium Dioxide, Copper Chlorophyllin]), Spirulina Algae (Arthrospira platensis), Chlorella Algae (Chlorella vulgaris), Green Tea Leaf Extract (Camellia sinensis), Anti-caking Agent (Magnesium Stearate). As a food supplement for adults, take one capsule daily with food or as directed by a healthcare professional. Do not exceed the recommended stated dose. To assure freshness, store in a cool, dry place, away from heat, light and moisture. Keep stored out of the reach of young children. If you are pregnant, or have any medical complaint consult your doctor before using this product. Below are reviews of Vega Vitamins Kelp & Greens Formula - 60 Vegicaps by bodykind customers. If you have tried this product we'd love to hear what you think so please leave a review.